On April 15th fast food workers across the USA walked out on strike to hold protests and marches demanding a $15/hour minimum wage. In the Twin Cities, striking fast food workers were joined by university workers, students, janitors, retail workers and airport workers. They call for a $15/hour minimum wage, paid sick days, and fairer scheduling of work hours. 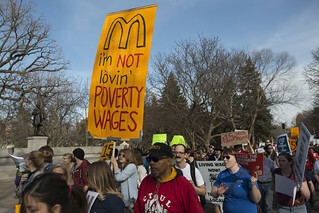 Protesters met at the University of Minnesota campus in Minneapolis and marched to the McDonalds restaurant in nearby Dinkytown.